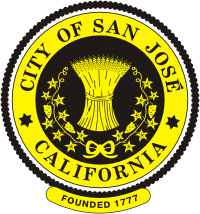 San Jose is a city in Santa Clara County, California in the United States. It is the third biggest city in California, after Los Angeles and San Diego. It is the tenth biggest city in the United States. It is south of San Francisco. The city has about 1,000,000 people. It has a warm-summer Mediterranean climate (Csb in the Koeppen climate classification). Wikimedia Commons has media related to San Jose, California. This page was last changed on 17 May 2018, at 18:24.